We stayed at the Happy Days Hotel on our road trip from Houston to Eureka Springs. It was an excellent choice! The people here are super friendly and this place is super cool with fun, clean rooms. Lots of really neat memorabilia from the 1950’s including a treasure trove of Elvis stuff. We arrived early enough to drive into the downtown area currently being revived and had a nice walk. McAlester has some beautiful brick buildings. The diner( Angel’s) next door was excellent. The hotel included breakfast was fine. Good conversation with other guests and staff. We made waffles and oatmeal and didn’t leave hungry. All in all we made an excellent choice! 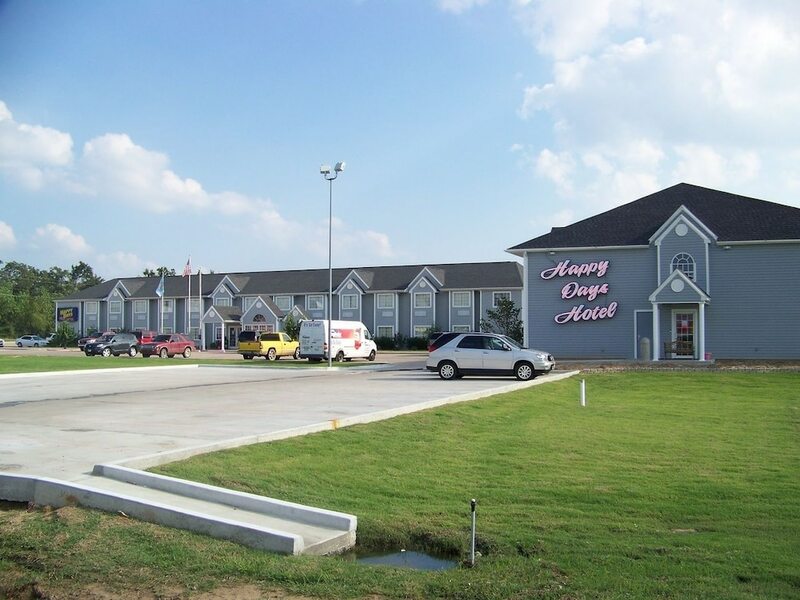 Non chain hotel on south side of McAlester. Close to food, stores and casino. %0's theme kinda hooky but SUPER NICE EMPLOYEES!! Clean!! Breakfast was fair but good! Diner next door good too! No problems, just a clean cheap place to stay where they take care of you! The James Dean and Marilyn oriented decor is kind of hokey but I think the owners are sincere so I'm OK with it. My room was clean and comfortable and I thought the rate reasonable. Diner conveniently located just across the parking lot. After finding this hotel through travelok.com we were very excited to stay here for a night while traveling through the state. This place has pretty good reviews, so we were excited to visit. The staff is very friendly and helpful which is great, the outside of the hotel is very nice, as are the hallways and front desk. But the rooms definitely need some remodeling and cleaning. We were disappointed to see that the pool was closed and not open yet, even though it’s the middle of May and 80+ degrees out the day of our visit. The room we stayed in was sad and nasty to say the least. The bed was clearly old, stained, and wore down, with 2 nasty stained pillows and the blanket was old and musty. The whole room smelled musty. There were bugs all in the air conditioner, the part that blows out the air. 😝 The bathroom was clean, except for the shower which had someone else’s hair still in the bottom of it! !🤢 We ended up not even staying the night. I couldn’t bring myself to sleep in the nasty bed! A few new sheets and mattresses would help this place out a lot! Probably won’t be coming back here ever. I loved the 50s decorations and the friendly staff, but I’d rather drive hours home than spend one night here. 👎🏼 I wish I had taken pictures of the room and bed, but we were very ready to leave here. Wife and I were looking for a clean and inexpensive hotel for 1 night for our trip to Texas. After searching on line reviews, I came across this hotel. I called them direct to make a reservation, easy to do and courteous clerk taking the reservation. They gave me a military (retired) discount and they welcomed me when I checked in. Being a boomer, we enjoyed the hotel decorations 50s/60s. the room was not fancy, basic but very clean. Bed was comfortable and a/c worked just fine. Bonus, they had 8 HBO channels included in the price and we were able to unwind and watch TV until lights out. I would definitely stay here again. What a quaint place. A tribute to the 50's and rock and roll. Arrived early and checked in straight away. Staff made us coffee after our long ride and nothing was too much trouble. Room was lovely and clean and dated in line with the hotel theme. Loved the candlewick bedspread too. Our room was Elvis and Route 66 theme. Very appropriate for our US road trip on a Harley. Got given a free bowling game for the 10 pin bowling alley behind the hotel which was good fun and ate an amazing steak dinner at Angels diner right next door. This hotel is great value for money and is highly recommended. I believe this to be an old County Inn & Suites, maybe and the owners are really trying to make the best of an older property. The building has some wear, but the decor covers that very well. It appears the owners are trying to maintain the property and they do have a well themed place. As I was getting settled, I got on my knees to see if there was an electrical receptacle beside the bed when I realized the floor was soaked, assuming the air conditioner drain was malfunctioning. They gladly had me change rooms. The young lady at the desk asked if the room smelled musty and I could honestly say no, it had a pine cleaner smell. Situation & resolved, what more can you ask. Parking was great. The restaurant across the parking lot was an easy walk & was good. Breakfast was standard & good. Staff was friendly. There were no blankets only sheets. had to request for 2 and only got one. The phone in the room was unplugged and when plugged back in didnt work. The pool is pretty small but we still made it work with the kids,. I did like the design bringing back the memories. We had the I love lucy room which was funny knowing each episode when we looked at the pictures. So like i said it was decent except for the phone and not having everything needed in the room. Located within a 5-minute walk of Great Balls of Fire, Happy Days Hotel is within a 15-minute stroll of Choctaw Casino McAlester. This 61-room hotel welcomes guests with free breakfast and conveniences like free in-room WiFi and free self parking. Start your day off right with a free continental breakfast, served each morning from 6 AM to 9 AM. This hotel is home to a steakhouse and a bar/lounge. A flat-screen TV comes with cable channels, and guests can stay connected with free WiFi. Other standard amenities include a refrigerator, a microwave, and an ironing board. Happy Days Hotel features free WiFi in public areas, a 24-hour business center, and a seasonal outdoor pool. There's free parking if you drive. The 24-hour front desk has staff standing by to help with dry cleaning or laundry, and answer any questions about the accommodations. Other amenities at this family-friendly hotel include a computer station, an arcade/game room, and laundry facilities. Free continental breakfast is served daily from 6 AM to 9 AM. Angels Diner - Restaurant specializing in regional cuisine. Open daily for breakfast, brunch, lunch, and dinner. Kid's menu available. Recreation features at Happy Days Hotel include a seasonal outdoor pool. The front desk is open 24 hours a day. Driving? This property offers free self parking, along with free RV, bus, and truck parking. Darling Carriage Home Right Next Door to the Community Pool!